Personalized one-on-one business consulting to help you build and grow a thriving and financially sustainable yoga business in alignment with your goals and dreams. Design authentic and honest marketing strategies to promote and sell-out your yoga offerings. Create a plan to grow your tribe and get more students in the door for your workshops, retreats, and classes. Build a finically sustainable yoga business, diversify your yoga offerings, and you're serving your students in alignment. Set the business foundation for a thriving yoga career, from your vision to your website, your email marketing, and your social media. Organize your business and create a plan to get things done without burning-out and getting overwhelmed. Design a yoga website on Squarespace from scratch + add some amazing bells and whistle to it! Website review, content creation and email marketing guidance. ** Don't see your topic on this list? These are BIG picture subjects I help my clients with. They can all be broken down to more specific topics. You can book a free call with me to see how I can help you with a more specific struggle. 60-minute consult sessions to design a personalized actionable game-plan for you. Comprehensive questionnaires to help me get to know you and your business goals. A video recording of our meeting along with 2-4 action steps to carry out before our next meeting. Weekly check-in via email to track your progress and answer any questions you may have. See the options below or set up a free 15 minute info call to discuss your goals and needs, and to see if any of these mentorship packages are a good fit for you. Just click on the button below to schedule your call. This is a great mentorship program to choose if you want to go a little deeper and need help with 2-4 topics in your yoga business. I only take a few yoga teacher mentees at the time. Please fill out the application below, and I will get back to you about our openings and the investment. A holistic approach to building a thriving yoga business that supports you and your students. In our DEEP DIVE mentorship program, we go over all aspects of your yoga business and help you set up a solid foundation for a sustainable of long-lasting career teaching yoga. What type of mentorship is this? This is an 8-week 1:1 mentorship program to take you from struggling and overwhelmed to confident and aligned yoga business owner. 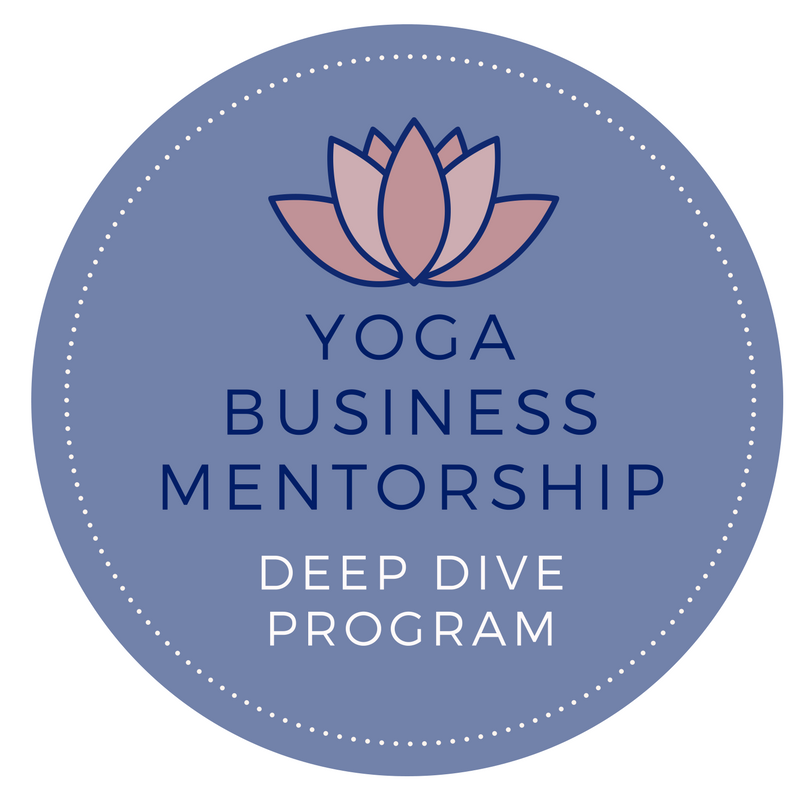 The Deep Dive Yoga Business Mentorship program is great for you if you have been teaching for some time and are looking to make your yoga business a full-time career. Maybe you feel overwhelmed and burned-out teaching too many studio classes, and want to diversify your yoga teaching to have more freedom. We go over all or most of the topics above, from your offerings to your marketing, to your students, and the financial health of your yoga business. How do I sign up to work with you in the Deep Dive 3-month Mentorship? I only take a few DEEP DIVE MENTEES per quarter. Please apply below, and I will get back to you to schedule a free call to make sure this is the right fit for you. Have a question about our Mentorship Programs? You can schedule a free call to talk to me about it or send me a message below and I'll get back to you! Happy to connect and support you!